When solving a vibration problem than not only the vibration source itself but also the machine structure is of great importance. An imbalance in eg. a fan will always result in vibration. However, the amplitude level of this vibration is strongly depending on the structural properties of this fan. 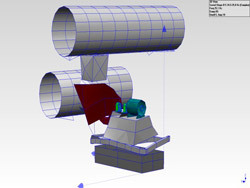 With an Operational Deflection Shape (ODS) analysis, van Geffen VMS is able to visualise the relative movement of the structure in a 3-dimensional animation. This animation directly shows the weak points in the structure. Dedicated adaptations to the structure and/or foundation will result in a significant reduction of the vibration level. An ODS-measurement is especially useful when the vibration source itself is impossible to remove or when structural resonances increase the vibrations. It also enables us to determine to which degree the various malfunctions as imbalance, misalignment etc contribute to the total vibration level on a machine or structure. Van Geffen VMS has the right knowledge and equipment to quickly perform the necessary measurements on-site. 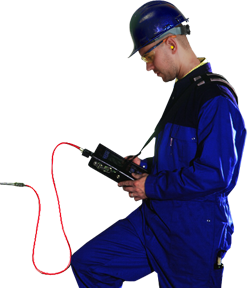 Our equipment is compact and portable, enabling us to perform ODS-analysis on high or hard to reach locations as in the offshore industry or on (wind) turbines. Structural resonances have an important role in vibration problems. A reliable solution often requires, next to an ODS-analysis, a combination of other advanced analyses technologies like order tracking, excitation measurements and transient analysis. Van Geffen VMS offers this powerful combination. We guarantee, together with our knowledge and experience, a thorough analysis and the best and most efficient solution for your problem.